The Committee for Medicinal Products for Human Use (CHMP) of the European Medicines Agency recently voted to recommend marketing authorization in the European Union (EU) for Axumin™ (fluciclovine (18F)). This recommendation specifically is for Blue Earth Diagnostics to market Axumin as a radiotracer in positron emission tomography (PET) imaging to detect recurrence of prostate cancer in adult men with elevated blood prostate specific antigen (PSA) levels after they completed first treatment. The CHMP’s positive opinion now will be reviewed by the European Commission. If approved, Axumin will be the first and only PET imaging agent indicated for use in men with suspected recurrent prostate cancer in all European Union member states as well as in Iceland, Liechtenstein and Norway. 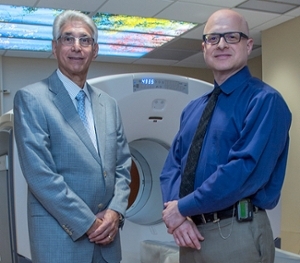 Emory Radiology’s Mark Goodman, PhD, who directs radiopharmaceutical discovery and holds an endowed chair of imaging sciences, developed the radiotracer along with Timothy Shoup, PhD, now at Massachusetts General Hospital. Emory Radiology’s David Schuster, MD, associate professor and director of the Division of Nuclear Medicine and Molecular Imaging, spearheaded the translational research work that led to FDA approval of Axumin for use in the United States in June 2016 (see story on FDA approval here). Blue Earth Diagnostics is a privately held company focused on the development and commercialization of novel PET imaging agents to inform clinical management and guide care for cancer patients in areas of unmet medical need. Axumin is its first approved and commercially available product.